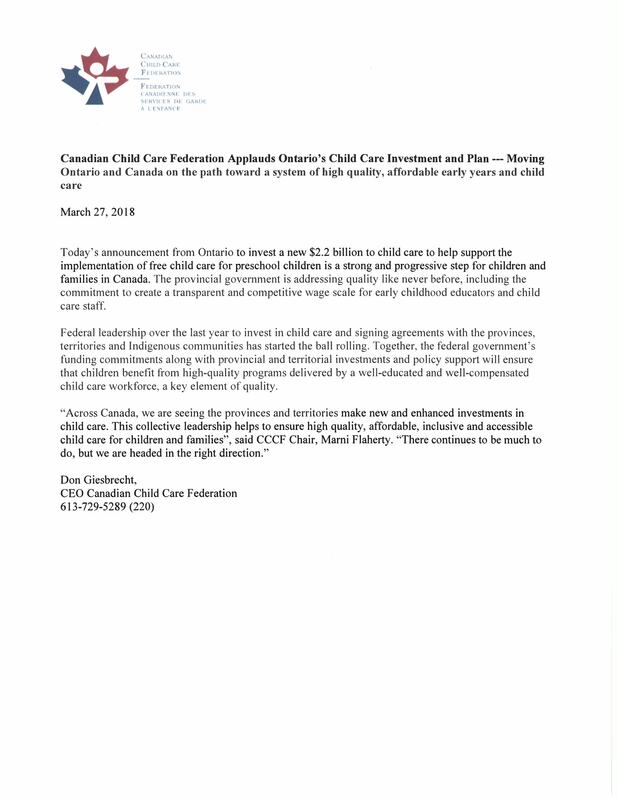 Ontario Premier Kathleen Wynne announced that full day licensed child care will become free for preschool children from the age of two and a half until they are eligible to start kindergarten beginning in 2020. Also included in the child care plan is increasing access to licensed child care, and a wage grid for all program staff working early learning and child care that will ensure their compensation is more closely aligned with the Early Childhood Educators working in full day kindergarten. Free child care for preschoolers is a key recommendation coming out of economist Dr. Gordon Cleveland’s report Affordable for All: Making Licensed Child Care Affordable in Ontario. Quality early learning and child care hinges on the availability of an educated and experienced child care workforce. The wage grid is a key recommendation in the Workforce Study for Early Years and Child Care Employees. This is an impressive multi-pronged strategy that addresses affordability, accessibility, and recruitment and retention. 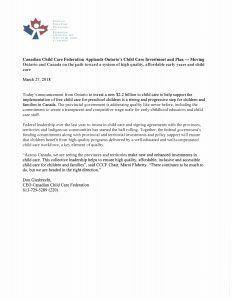 It is one of the biggest child care policy announcements since Quebec launched the universal $5.00 a day child care plan in 1997. It sets the bar high for all provinces and territories in Canada and MCCA hopes the Government of Manitoba is working an an equally comprehensive, bold, and visionary strategy.